The Brazil Ambassador and the Tabon Chief with others cutting the cake at the ceremony. 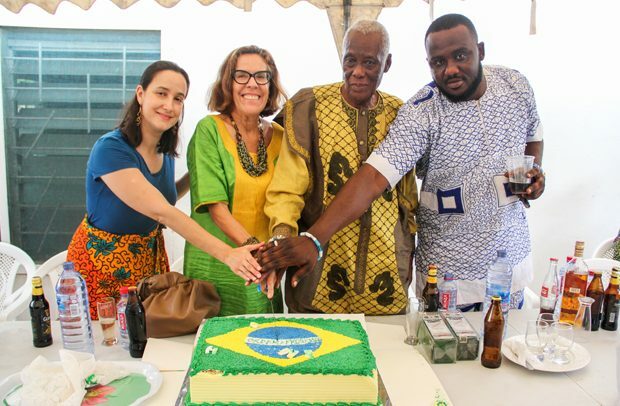 The Brazilian Ambassador to Ghana, Maria T. de Luna, last Saturday joined the Tabons, descendants of freed African slaves from the Latin American country, to observe a unity ceremony at Dansoman in Accra. The colourful cultural activity was intended to restore unity in the Ga State and to provide a narration about the Tabons and the reception they were accorded by Nii Ankrah I who received the new arrivals from Brazil towards the mid 1800. By design, the ceremony was held at the palace of the Tabon Mantse and Adontehene of the Mantse Ankrah Royal family, Nii Azumah V.
Nii Adjabeng Ankrah II, head of the Mantse Ankrah Royal Family, Asafoatse Tawiah III, and other important dignitaries graced the event with lots of traditional music and dance performances. In his address, the Tabon Mantse, Nii Azumah V, expressed delight in the success of the ceremony adding that it was intended to unify the Ga State and reconnect it to its historical roots. He disclosed that it was the then Ga Chief, Nii Ankrah I, who welcomed the returnees from Brazil and gave them portions of land to settle on and farm. The Chief Linguist of the Tabon Traditional Council, Okyeame T.T. Nii Akramah Quarcoo I, said millions of Africans from the West Coast of the continent were taken to Brazil. Their descendants returned in 1836 with bits of the Brazilian culture. He disclosed that the word ‘Tabon’ is a Portuguese word which meant ‘Good People’. An elated Brazilian Ambassador who came in the company of some loved ones said it was a great pleasure to be a part of such a ceremony adding that it was touching to see so many cultural similarities here with what she had seen in her country in terms of music, dance and food. The ambassador disclosed that on the agricultural front, plans are underway to help stock food for export and also 60 scholarships to Ghanaian students to study in Brazil. Director at the Centre for Latin American Studies at the University of Ghana, Legon, Dr. Joana Boampong, who was also at the event, said her department, which is interested in everything regarding Latin America of which Brazil is part, has a project on the works of the Tabon people. She asked that the youth be encouraged to take interest in their cultural heritage so that they do not lose track of their history. “The oral history needs to be told. It should be done in a way that would excite them. The importance of the tradition should be made known to them so that they can always be proud of it”, she said.